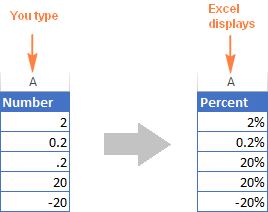 In this short tutorial, you will find many helpful details about Excel percent format and learn how to format existing values as per cents, how to show percentage in empty cell and change numbers to percentages as you type. Even a faster way is pressing the Ctrl + Shift + % shortcut (Excel will remind you of it every time you hover over the Percent Style button). Although formatting numbers as percentages in Excel takes just a single mouse click, the results may vary depending on whether you apply the percent formatting to existing numbers or empty cells. When you apply the Percentage format to cells that already contain numbers, Excel multiplies those numbers by 100 and adds the per cent sign (%) at the end. From Excel's viewpoint, this is the correct approach since 1% is one part of one hundred. However, this way does not always work right. For example, if you have 20 in cell A1 and you apply the percentage format to it, you will get 2000% as the result, and not 20% as you might expect. Finally, you can replace the formulas with values in column B, copy them back to column A and delete column B if you do not need it any longer. Any number equal to or greater than 1 is converted to a percent by default. For example, 2 is turned into 2%, 20 into 20%, 2.1. into 2.1% and so on. 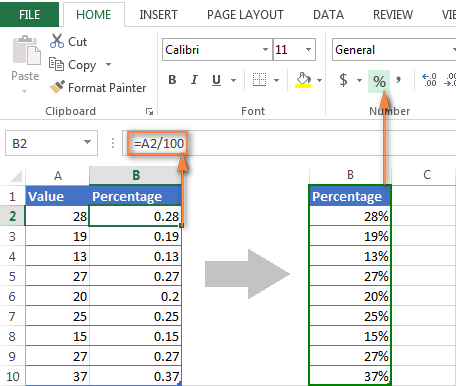 If you type 20% (with the percentage sign) directly in a cell, Excel will understand that you are entering a percent and will apply percentage formatting automatically. When applying the percentage formatting it Excel, please keep in mind that it is nothing more but a visual representation of a real value stored in a cell. The underlying value is always stored in decimal form. In other words, 20% is stored as 0.2, 2% is stored as 0.02, 0.2% is 0.002, etc. When performing calculations, Excel always deals with the underling decimal values. 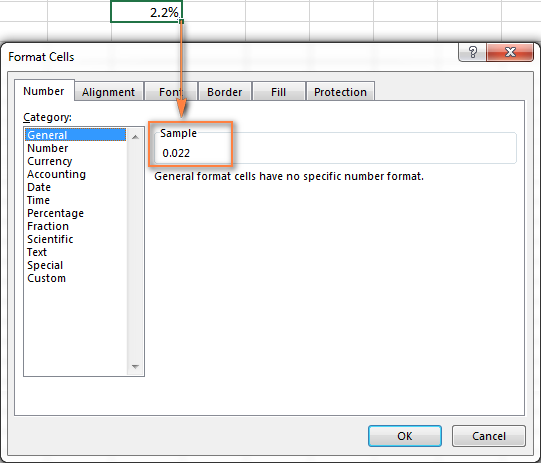 Please remember this fact when referencing percent cells in your formulas. 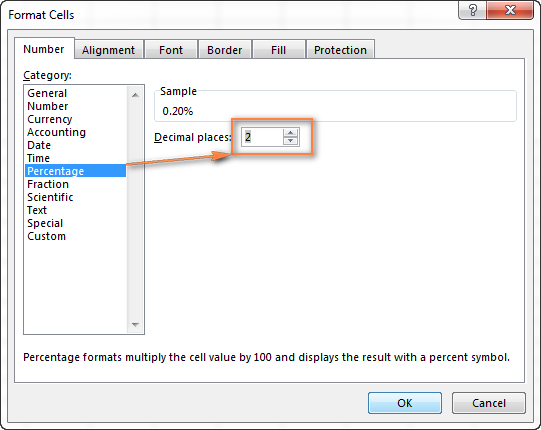 To see the real value behind percentage formatting, right-click the cell, click Format Cells (or press Ctrl + 1) and look in the Sample box under the General category on the Number tab. 1. Display as many decimal places as you want. 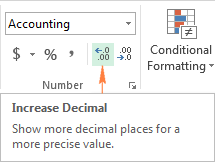 When applying percentage formatting to numbers, Excel 2016, 2013 and 2010 display their rounded versions with no decimal places, which may cause some confusion. 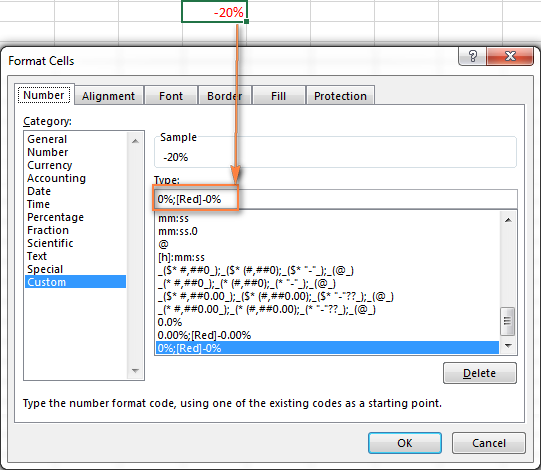 For example, apply the percent format to an empty cell and then type 0.2 into it. What do you see? In my Excel 2013, I see 0% though I know with certainty it should be 0.2%. To see the actual percentage instead of a rounded version, you just need to increase the number of decimal places showing. To do this, open the Format Cells dialog either by pressing Ctrl + 1 or right-clicking the cell and selecting Format Cells… from the context menu. Make sure the Percentage category is selected and specify the desired number of decimal places in the Decimal places box. When done, click the OK button to save your settings. 2. Apply a custom format to negative percentages. 00%;[Red]-0.00% - format negative percentages in red and display 2 decimal places. 0%;[Red]-0% - format negative percentages in red without any decimal places showing. You can find more details about this formatting technique in the Display numbers as percentages article by Microsoft. 3. Format negative percentages using Excel conditional formatting. Compared to the previous method, Excel conditional formatting is more versatile and it lets you display negative percentages, e.g. percent decrease, in any format of your choosing. Then you choose one of the formatting options from the drop-down list on the right, or click Custom Format... at the end of the list to set up for own formatting. For more information about creating conditional formatting rules, please see How to use conditional formatting in Excel. This is how you work with Excel percent format. Hopefully, this knowledge will help you avoid a lot of headache when you in the future. In the next articles, we are going to learn how to calculate percentages in Excel and write formulas for percent change, percentage of a total, compound interest and more. Please stay tuned and thank you for reading! 26 Responses to "How to show percentages in Excel"
Is there a way I can use any function to convert a part of the calculation to percentage? To give an example - I'm using a formula to show notes in my report where I want to show the max savings (in %) from a particular location/country (dynamic). 1. "ROUND(MAX(H23:K23),2)" is used to calculate and show the percentage (somehow it is showing in decimals currently). This is what I want to show as %. 2. "(HLOOKUP(MAX(H23:K23),H23:K24,2,FALSE))" is used to calculate and show the location where the maximum savings are coming from. Suggestions would be really appreciated. thanks in advance. If I have a line item that has a $0 budget but spent $400. How do I show that in percent? You can type %20 in an empty cell and Excel will display it properly. Suppose you entered a value as 0.72 in a number field having percentage format. But in place of 72% , it is displaying 100%. Can you find out a reason. how can i find the percentage. Can you please help me get notes and examples of using the financial functions in excel. Let me thank you very much for the excel knowledge you are sharing. Please keep it up and know that we are very grateful. where GB is Gigabytes and TB is terrabytes I have to calculate percentages of above data but due to GB and TB in numbers I am getting errors. How can this be sorted out. I think there are at least two ways to solve your problem. If you don't have many of these rows to split, just use the Text-to-Columns tool in Excel. Under Data choose the Text-to-Columns use the fixed width and that should do it. What I did when I was practicing with your sample data was to copy and Paste Special/Transpose it so I could get it into columns so I could split the top three into columns and then the second three. If you have a lot of this data you can use this formula. It will split out the numbers for you. It needs to be entered with CTRL+Shift+Enter because it is an array. You can change E9 to the address you need. I am trying to deduct a percentage (%) from a cell into another cel? There are a total of 40 hours the class can be used per week from 8-4. How do I find the percentage of time used of the classroom. If there are 40 total hours the class can be used and one class is at 5.20 hours of usage per week and another is 2.30 hours per week - what is the percentage of use time for each individual class out of 40 hours. How can I find the 20 % mark of a students mark, I want to prepare progress report. I just want to know the formula. I have a a document showing whether someone was late, early or on time. I need to get the percentage of how any times someone was late, early or on time. The thing is, is that it's marked down as "X" in the appropriate column and I don't know how to get the percentage. Help, please? !